Global approval of President Barack Obama’s policies has declined significantly since he first took office, while overall confidence in him and attitudes toward the U.S. have slipped modestly as a consequence. Europeans and Japanese remain largely confident in Obama, albeit somewhat less so than in 2009, while Muslim publics remain largely critical. A similar pattern characterizes overall ratings for the U.S. – in the EU and Japan, views are still positive, but the U.S. remains unpopular in nations such as Egypt, Jordan, Turkey and Pakistan. Meanwhile, support for Obama has waned significantly in China. Since 2009, confidence in the American president has declined by 24 percentage points and approval of his policies has fallen 30 points. Mexicans have also soured on his policies, and many fewer express confidence in him today. The Obama era has coincided with major changes in international perceptions of American power – especially U.S. economic power. The global financial crisis and the steady rise of China have led many to declare China the world’s economic leader, and this trend is especially strong among some of America’s major European allies. Today, solid majorities in Germany (62%), Britain (58%), France (57%) and Spain (57%) name China as the world’s top economic power. Even though many think American economic clout is in relative decline, publics around the world continue to worry about how the U.S. uses its power – in particular its military power – in international affairs. There remains a widespread perception that the U.S. acts unilaterally and does not consider the interests of other countries. In predominantly Muslim nations, American anti-terrorism efforts are still widely unpopular. And in nearly all countries, there is considerable opposition to a major component of the Obama administration’s anti-terrorism policy: drone strikes. In 17 of 20 countries, more than half disapprove of U.S. drone attacks targeting extremist leaders and groups in nations such as Pakistan, Yemen and Somalia. Americans are the clear outliers on this issue – 62% approve of the drone campaign, including most Republicans (74%), independents (60%) and Democrats (58%). These are among the principal findings from a 21-nation survey conducted by the Pew Research Center’s Global Attitudes Project from March 17-April 20. The poll also finds that, despite disappointment with Obama’s policies, there is still considerable support for his re-election in many countries, especially in Europe. Roughly nine-in-ten in France (92%) and Germany (89%) would like to see him re-elected, as would large majorities in Britain (73%), Spain (71%), Italy (69%) and the Czech Republic (67%). Most Brazilians (72%) and Japanese (66%) agree. But in the Middle East there is little enthusiasm for a second term – majorities in Egypt (76%), Jordan (73%) and Lebanon (62%) oppose Obama’s re-election. Majorities or pluralities in 12 countries express a favorable opinion of the United States, while the prevailing view is negative in only five nations. In three countries views are closely divided. Attitudes toward the U.S. are generally more positive today than in 2008, the final year of the George W. Bush administration. The biggest improvements in America’s image have occurred among Europeans – in France, Spain, and Germany, the percentage of people with a positive view of the U.S. is at least 20 percentage points higher than in 2008. However, some of the initial surge in pro-American sentiments that followed Obama’s election have waned in Western Europe, especially in Germany where 64% had a favorable opinion of the U.S. in 2009, compared with 52% today. In Japan, 72% currently express a favorable opinion of the U.S., up from 50% four years ago. America’s image in Japan improved dramatically in 2011, due in part to American relief efforts following the devastating March 2011 earthquake and tsunami. Fully 85% of Japanese respondents expressed a positive view of the U.S. in last year’s poll. In a number of strategically important Muslim nations, America’s image has not improved during the Obama presidency. In fact, America’s already low 2008 ratings have slipped even further in Jordan and Pakistan. Even in many nations where overall ratings for the U.S. remain low, however, certain aspects of American “soft power” are often well-regarded. For instance, the American way of doing business is especially popular in the Arab World – more than half in Lebanon (63%), Tunisia (59%), Jordan (59%) and Egypt (52%) say they like this element of America’s image. Majorities or pluralities in 18 of 20 countries admire the U.S. for its science and technology, and most of the publics surveyed embrace American music, movies and television. Around the world, U.S. ideas about democracy and American ways of doing business have become more popular since Obama took office. American soft power is often particularly appealing to young people. In particular, U.S. popular culture and American ideas about democracy are more popular among people under 30. Still, even as they embrace certain features of American culture, people worry that it may crowd out their own cultures and traditions – majorities or pluralities in 17 of 20 countries say it is a bad thing that U.S. ideas and customs are spreading to their countries. While confidence in Obama has slipped, in many of the countries surveyed, people continue to express confidence in President Obama’s foreign policy leadership. In particular, he still gets extremely high ratings in much of Europe. More than seven-in-ten in Germany, France, Britain, the Czech Republic and Italy express confidence that Obama will do the right thing in world affairs. Big majorities in Japan and Brazil also hold this view. There is little support for Obama, however, in the predominantly Muslim nations surveyed. Fewer than three-in-ten express confidence in him in Egypt, Tunisia, Turkey and Jordan. And roughly a year after he ordered the Abbottabad raid that killed Osama bin Laden, just 7% of Pakistanis have a positive view of Obama, the same percentage that voiced confidence in President George W. Bush during the final year of his administration. Outside of Pakistan, however, Obama consistently receives higher ratings than Bush did in 2008. This is particularly true in Western Europe and Japan, but it is also true in several predominantly Muslim nations where Obama’s ratings – while not especially high – are nonetheless more positive than his predecessor’s. In nearly every country where trends are available, support for Obama’s international policies has declined over the last three years. Even though most Europeans still endorse Obama’s policies, their enthusiasm has ebbed. Among the EU countries surveyed in both 2009 and 2012, a median of 78% approved of Obama’s policies in 2009, compared with 63% now. Among Muslim nations, the median has slipped from 34% to 15%. Major declines have also taken place in China, Japan, Russia and Mexico. On a number of specific issues, there is a sense that Obama has not lived up to the expectations people had for him when he first took office. The 2009 Pew Global Attitudes survey found that many believed the new American president would act multilaterally, seek international approval before using military force, take a fair approach to the Israeli-Palestinian conflict, and make progress on climate change. As the current survey reveals, few now believe he has actually accomplished these things. For instance, looking at the countries surveyed in both 2009 and 2012, a median of 56% in 2009 expected Obama to take significant steps to deal with climate change. Today, a median of just 22% think he has actually done this. China’s image has slipped in several countries over the last year. The percentage of Japanese with a favorable opinion of China plummeted from 34% to 15%. In France, China’s favorability ratings dropped from 51% to 40%, and in Britain from 59% to 49%. And since last year, Americans have become less disposed to rate China positively (51% in 2011, 40% now). 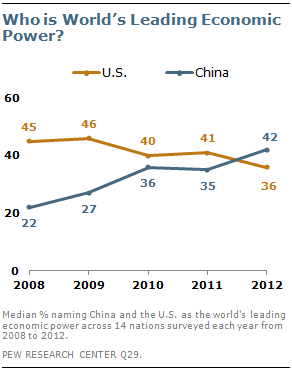 However, perceptions of China’s economic power continue to grow. This is especially true in Europe, but the belief that China is the world’s top economy has become more common in the last year in other parts of the world as well, including Brazil, Japan, Turkey and Lebanon. Views about the economic balance of power have shifted dramatically over time among the 14 countries surveyed each year from 2008 to 2012. In 2008, before the onset of the global financial crisis, a median of 45% named the U.S. as the world’s leading economic power, while just 22% said China. Today, only 36% say the U.S., while 42% believe China is in the top position. Global publics are much less interested in the 2012 U.S. presidential election than they were in the 2008 contest. For example, four years ago 56% of Germans were closely following the race, compared with just 36% now. Much like President Obama, U.S. Secretary of State Hillary Clinton receives largely positive marks in Western Europe, but is unpopular in the predominantly Muslim nations surveyed. German Chancellor Angela Merkel receives mostly favorable ratings in Europe – with the clear exception of Greece, where only 7% express confidence in her. Russian President Vladimir Putin is rated negatively in most of the countries surveyed, and Russia’s overall image has declined since last year in Western Europe and the U.S.